My favourite ethical outfit: second hand Levi’s from Ebay, vintage linen shirt from Oxfam, tote bag from Self Care Company and handmade straw hat from Maison Philou. I’m also wearing second hand Converse trainers from Ebay. I’m often asked for a list of the places I shop for ethical fashion, but the reason I can’t ever give you a big list off the top of my head is because the truth is that I don’t actually shop much at all. So often I hear people protest that they can’t get into sustainable fashion because it’s too expensive, but what most people never consider for a second is that perhaps they just don’t need to buy any more stuff at all. We have been conditioned since we were children to receive constant marketing messages, that tell us on one hand we are inherently flawed and on the other hand that buying clothes, beauty products etc will fix us. We have been on this cycle of following trends, buying new clothes each season, buying as much as we can and buying it cheap that most of us don’t even realise how brainwashed we are by these large companies and fast fashion retailers who have only one goal in mind - to make us spend. And sadly, the biggest way they keep us spending is to keep us unhappy, making us feel like we aren’t enough. I think we are all so used to constantly feeling like we aren’t enough, that we don’t even question why it is we really feel like this and make ourselves aware of the behaviours that result from those feelings. These companies exploit us, they exploit the environment, and they exploit communities across the world to work in dangerous conditions for next to no wages just so we can fill our wardrobes with cheap clothes we don’t wear. I watched Stacey Dooley’s BBC documentary “Fashion’s Dirty Secrets” earlier this week (still available for 23 days for UK viewers if you haven’t watched it yet) like so many people in the UK have done, and even though I’ve been aware of the impact of fast fashion for a long time, I was shocked, upset and angry at the scale of the environmental devastation that fast fashion has caused to the developing world. I know that everyone that watched it felt the same, and I’ve spoken to a lot of people for whom it has been the catalyst to make changes to their shopping habits. We want to be part of the solution, but it can feel like we are such a tiny part of this enormous problem that we wonder if our efforts will make any difference at all. So, if we want to move towards a more sustainable wardrobe, where do we begin? Well, I’d argue that rather than changing where we shop, it all begins with changing HOW and WHY we shop. In fact, the most important thing you can do is really to put the brakes on buying anything new at all, because it’s the extreme levels of consumerism across the world that is the root of so many of our problems. The cycle of buying, and eventually disposing of things that harm the environment, many things which we could have avoided buying in the first place. I think if we can address some of the core motivations we have for our consumption, we will begin to shift our thinking to a place where we no longer feel we need or want what these fast fashion companies are selling. Now, it’s important to say that I don’t believe the solution lies 100% with the consumer. The fast fashion retailers are the ones with the dirty hands, and they must be steered by government legislation before they will ever make big enough changes and fast enough to change the bleak direction we are headed in regarding the environment. However, I do believe that we have power as consumers, and that we can no longer shirk our responsibility to make some changes to our habits. If we aren’t buying what these companies are selling, then they have to move with the demand for more sustainable clothing or they will go out of business. We can put pressure on them by voting with our feet, by using whatever influence and mouthpiece we have to say that enough is enough. I don’t believe that doing nothing is ever an option. Even if we can’t change the world overnight by our actions, does that really mean we should stop trying? Change takes time, and if change won’t come top down first then we have to make the choice to begin at the roots. Use our voices, use our brains and use our purses. In recent years, I’ve had a huge shift in my mindset around clothes and made some big changes to my shopping habits. I’ve never been the biggest shopper, or much interested in trends, but I have been of course been guilty of impulse buying things I don’t need just because I happen to be in a high street shop, or because I clicked the link in a marketing email and felt like treating myself. I like clothes and I care about the way I look and what I wear. I’m guilty of being sucked in to wanting new things, to having more than I need because these shops turn me into a magpie and convince me that I absolutely MUST HAVE that new bag or jumper to be my best self this season. I buy things that I haven’t researched, from companies with practices I don’t support, end up with things I don’t wear, don’t need and that end up cluttering up my home and driving me crazy. It was only once I made the effort to break the cycle, to turn away from anything the fast fashion industry has to sell me that I started to find it a lot easier to change my habits. Unsubscribe from all mailing lists for any fast fashion retailers, and ideally off of any retail mailing lists whatsoever. It’s all too easy to click through a link in an email and buy something on impulse that you don’t need. Just click unsubscribe, and don’t tempt yourself. Unfollow brands, influencers, celebrities on social media that either make you want to spend money, or make you feel insecure about yourself. Whatever your trigger points are (mine are fancy children’s clothing brands), just unfollow them and remove yourself from temptation. Start to pay attention to how you feel when you see certain images, and as soon as anything sets off that urge to spend or to beat yourself up about anything, just press the unfollow button right away. Avoid shopping centres, major high streets and any fast fashion shops with cheap clothing that are designed to make you want to spend. If you get tempted in these situations (I know I do) then just don’t go there. Personally, they always make me feel inadequate, like what I have isn’t good enough, like my body isn’t the way I want it to be, and like I am unsuccessful because I don’t earn enough money to shop in these places. Completely removing myself from these places at all was a huge thing for me in starting to feel better about myself and preventing me from impulse buying. Shop second hand. Ebay, Depop, charity shops (Oxfam have a great online shop), vintage shops and clothing swaps are all wonderful places to find good quality clothing at a fraction of the price you’d pay for new items. Sure, it’s harder work and takes a little more planning to get your winter jacket in time for the cold weather, but that’s half the fun of it. It’s especially brilliant for kids clothes and maternity wear because most of those items have only been worn a few times, and people are always trying to declutter them. Declutter your wardrobe, and commit to owning less. I bet you’ll be shocked at just how much you have that you don’t wear, need or even want any more. Be ruthless and only keep items you love, that fit you well and that are your true style. My friend Jessica Rose Williams is the guru of simplifying your wardrobe. She has lots of great free content on her blog, and runs an e-course as well, and she really supports you and cheers you on in your journey to own less stuff. Decluttering helps you hone your style, see what you actually wear and own so you don’t purchase multiples of the same thing (i.e ten different striped tops!) and not to mention it’s completely liberating to cut down on the amount of stuff you have. Once you start, you won’t look back! Do you really need six different pairs of work out trousers? Unless you’re at the gym an hour a day, I suspect not. Stop shopping for trends or seasons, and instead take time to hone your personal style. Consider anything you do buy as an investment piece that you will have for years to come. Build a high quality, sustainable wardrobe that fits you, suits you and works together so you can buy less but buy better. Always the mantra you should have when trying to be more sustainable! When you are more aware of the kind of clothes that suit you, the colours you like, the fabrics that work for your body shape etc the less likely you are to buy things that you end up not wearing. I’m going to recommend my friend Jessica Rose Williams again to help you with this. Try her '“how to build a year round capsule wardrobe” ebook, it’s a great place to start. Learn how to take care of the clothes you own. Different fibres need to washed, dried and stored in different ways to help preserve them and lengthen their life span. The more you take care of what you have, the less that needs to be thrown away. Read the care labels, wash things less frequently, use lower temperature settings, air dry your clothes and store things properly to prevent moths and mould. Educate yourself on the true cost of fast fashion. When confronted by images of collapsed sweatshops, extreme environmental devastation, I can’t believe that anyone doesn’t feel emotional and angry. The True Cost is an eye opening documentary on Netflix which is a good place to start. Take a look around the websites of your favourite fashion retailers and read up on their ethical practices. I’m betting a lot of them don’t have one, or at best their policies are flimsy. Once your eyes are opened, it’s much harder to ignore the system we are all part of when we shop for our clothes. Research companies that are producing their clothes in an ethical and sustainable way. Spoiler alert, almost none of these are on the high street. My favourite larger ethical clothing companies are Fat Face, Thought and People Tree - all are great for basics like jeans, t-shirts and jumpers. The clothes are good quality, fit well and although are more expensive than cheap stuff at H&M, they’re not too pricey and are made to last. There are some wonderful independent ethical clothing brands out there too, having conversations about the impact of fashion, being transparent about every stage of their process and always trying to do better. I’m going to compile a list and write a post soon that I can link to from here! Consult the Good Shopping Guide before you make a purchase. The Good Shopping Guide is a really comprehensive guide of all the major brands and items you might want to buy, so when you’re looking for a new pair of socks you can easily check up on which companies produce the most ethically made ones. It rates each company by a variety of different ethical practices; animal welfare, environmental reporting and so on making it easy to see how well each one scores in each area. They have some good articles and research around ethical fashion in general, and they have an ethical fashion directory you can consult to find some new brands to shop from. Ultimately, moving towards a more sustainable wardrobe is a journey and it’s OK to be a work in progress. I mean, that’s what we all are all of the time, right? In my experience, our shopping habits run deep and are intertwined with what we tell ourselves about the way we look. We, especially as women, are told by almost everyone we come across that we aren’t enough, and it’s this deep rooted feeling that makes us so susceptible even more messages about all the things that are supposedly wrong with us. Believing we are enough, that we are beautiful and valuable just as we are, that we have more to offer the world than our outward appearance is a vital step in making better choices about what we buy and where we shop. And the more you remove yourself from the cycle of shopping, keeping up with trends, buying more stuff you don’t need, the more you realise how brainwashed we’ve become and the easier it is to resist the siren call of these marketing messages. At last we can save our money, feel better about ourselves, stop wasting our time trying on unflattering clothes in tiny changing rooms under harsh lighting and judging ourselves and bodies for the way they look. And ultimately, give two fingers up to these retailers who have spent too long caring only about their profits. These big fashion companies know how we tick. They know the chemicals that shopping releases in our brains, and they know how to target our deepest insecurities or fantasies to get us to spend money in their stores. They want your money, and they don’t care about you or the people and places they exploit and harm in the name of their profits. It’s time we turn our backs on them, before it’s too late. All you have to do is commit to making the changes you can, one step at a time. I hope some of my tips have empowered you to feel able to make some changes of your own. 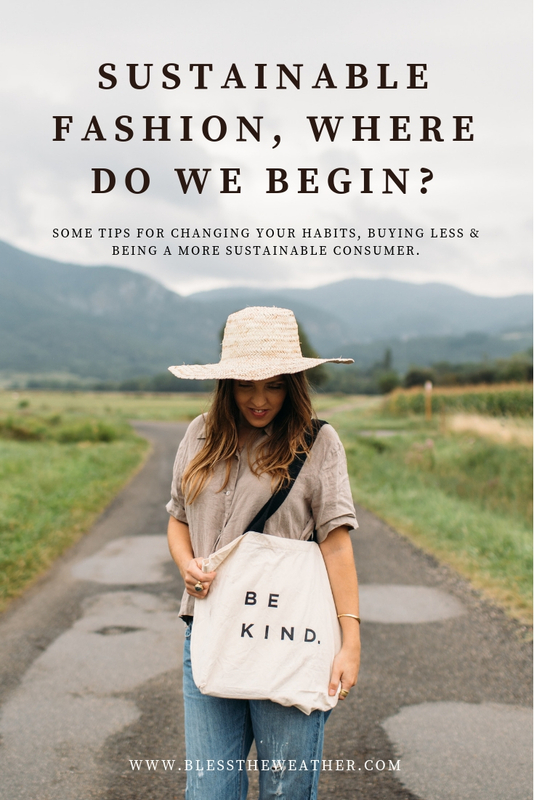 Have you begun a journey of making more sustainable fashion choices for yourself? I’d love to hear about it. Leave a comment and share your story with me, any tips you have and any ethical fashion brands that you love to support.